Form OW-8-P-SUP-I is a Oklahoma Tax Commission form also known as the "Oklahoma Annualized Income Installment Method For Individuals". The latest edition of the form was released in January 1, 2017 and is available for digital filing. 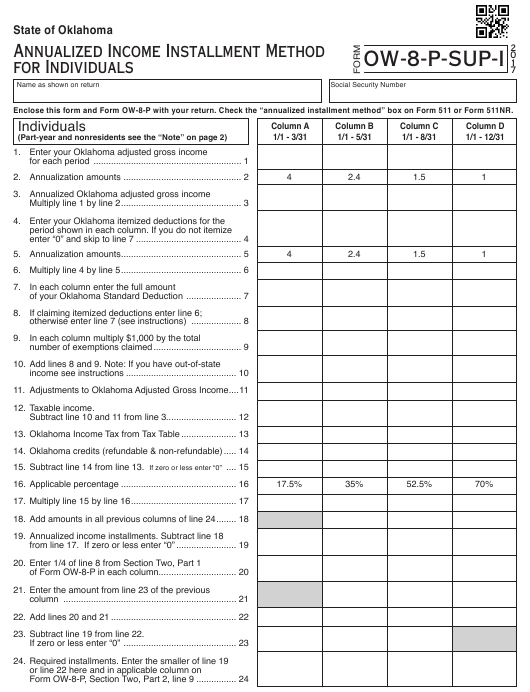 Download a fillable PDF version of the Form OW-8-P-SUP-I down below or find it on Oklahoma Tax Commission Forms website. Enclose this form and Form OW-8-P with your return. Check the “annualized installment method” box on Form 511 or Form 511NR. 15. Subtract line 14 from line 13. 23. Subtract line 19 from line 22.
installments). You must complete Section Two, Part 1 of Form OW-8-P before you can complete this form. by Individuals, Estates, and Trusts” or Federal Publication 505 “Tax Withholding and Estimated Tax”. Federal return for the period shown in the column heading, enter line 7.
prorated amount on line 10.
for Form 511, Schedule 511-C or Form 511NR, Schedule 511NR-C in the individual income tax packet. tion used to figure the credit; include any credit(s) you are carrying over from a previous year.